Born in Paris to Russian parents and educated in America, Elliot Erwitt was working in New York in his twenties as a studio assistant to photographer Valentino Sarra. Drafted into the American army in 1951, he served as a photographer in the Signal Corps in Germany and France, during which time he made a name for himself with photo essays on barracks life. After joining Magnum in 1953, Erwitt travelled the world as a successful freelance photographer capturing famous faces and places, and producing quirky studies of dogs. 'Moscow' and 'New York City' 1953 (AGNSW collection) are representative of the balance Erwitt strove to create between a body of personal work, while simultaneously pursuing professional commercial practices. 'New York City' is from an early photo essay in which he documented his first wife's pregnancy and the birth of their daughter. This softly focused, tender observation of form and emotion offers a quiet meditation on the simple flow of life, and it remains one of his most intimate and personal series. In contrast, 'Moscow', more closely cropped and teeming with action, was taken on assignment for 'Life' magazine when Erwitt was sent to cover an American Industrial Exhibition in Russia. It became a defining moment in his professional career. 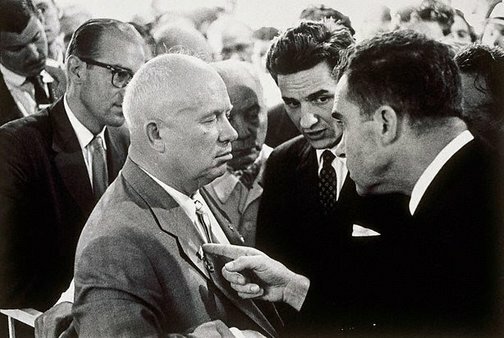 In the foreground Erwitt captures the decisive moment during the infamous 'kitchen debate' when then vice-president Richard Nixon belligerently prodded the communist party chairman Nikita Khrushchev on the lapel. This unguarded study reveals the human side of power; the frictions and insecurities of the politicians shaping the world at that time. Witnessed by a sea of journalists, 'Moscow' became an iconic image and was later reproduced on posters during Nixon's presidential bid. Signed l.r. sheet, ink and c.verso, pencil "Elliott Erwitt". Dated c.verso, pencil "...1959". Martyn Jolly, Photography: Art Gallery of New South Wales Collection , 'International photo-documentary', pg.151-167, Sydney, 2007, 156, 165 (illus. ).